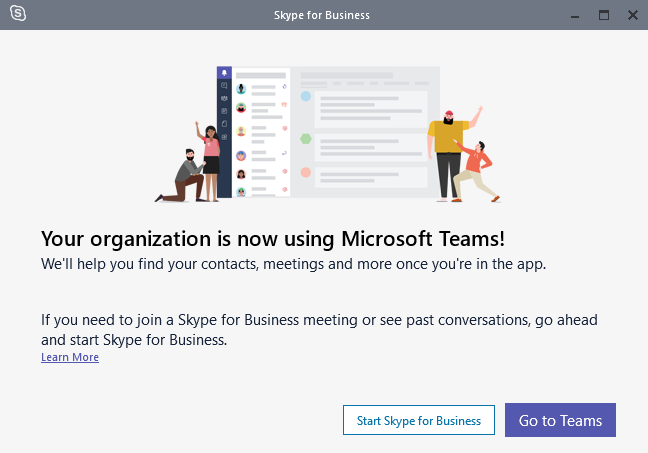 Teams is replacing Skype for Business – how does it (really) work for the user? Most of us know Teams is replacing Skype for Business in Office 365. There is no official end date but we see indications. 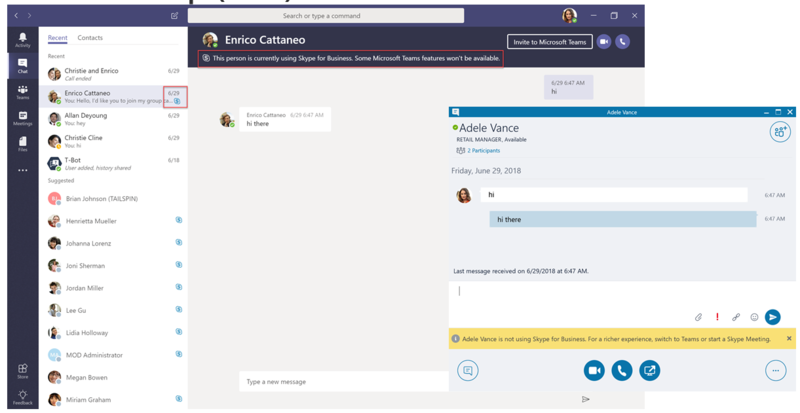 Microsoft is no longer adding Skype for Business for new tenants with less than 500 users and they say Teams is now complete. Yesterday we also saw the first indication that Microsoft is starting to switch active tenants to Teams – so you better be ready! Looking at the official Microsoft documentation, all is green and good. Just switch and you will experience all the goodness of Teams. But how does it really work and look for the end user? I assume you already know how Teams works and looks and the way to migrate – this blog post is just how it works for the end-user when it comes to interoperability with Skype for Business. NOTE: Might change on short notice. Here is the Microsoft official documentation on interoperability. You decide to switch one of your users (let’s call him Ben) to TeamsOnly mode and the rest of the users are still in SfB. Remember, there is nothing stopping all the other users to start using Teams, they just have to go to https://teams.microsoft.com and they can use SfB and Teams simultaneously. If both users are in Teams (in case some other users have found out they can use Teams) you will get the full experience so I will not go into details there. Ben will be able to receive and reply to messages received from Sfb users within the Teams client. 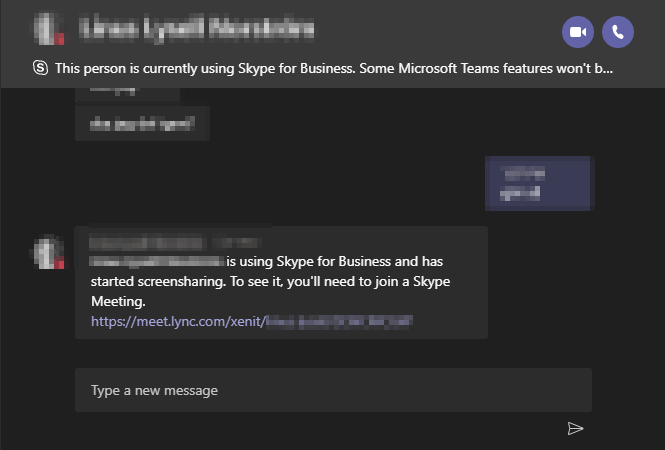 Screen sharing and file transfer is not supported between Teams and Skype for Business – you need to create a meeting for that. There is one caveat here, if the other user has ever started Teams weeks/months ago, they are considered to be “activated in Teams” which means Ben no longer can initiate a new SfB conversation with that user. Ben can only initiate a new conversation with the other user in Teams and if that user is no longer using Teams (for example if they decided they didn’t like it), they will not receive it. However, if the other users initiates chat from SfB to Ben, Ben will be able to reply to SfB. The absolutely best feature is that you have persistent chat experience over all devices so you can initiate a chat session in a web browser on your laptop, continue in the fat client on your desktop and keep the whole thread in your mobile device. So imagine all your users are in Teams. But you will see that many other organizations are still using SfB in Office 365 or on-premises – how do you communicate with them? Again, if both users are in Teams you will get the full experience so I will not go into details there. Ben will be able to both initiate, receive and reply to SfB chat sessions. Ben can still join SfB meetings, that’s what the SfB client is used for and needs to be running in the background. So we don’t see that going away very soon. Or, of course, he could use the SfB Web App if the SfB application is not installed. Ben can’t initiate screen sharing nor file transfers to SfB users – a meeting is required for that. If the other user (still on SfB) initiates a screen sharing or file transfer to Ben, it is not supported and the official answer is that the user should receive the following message and a meeting is required. However, we have found that if Ben has his SfB client started, logged in and active in the background he will receive the following message and by clicking this link he will be able to see the screen sharing session and receive the file. YMMV. Ben will also realize that the New Skype Meeting choice will be removed in Office 365 ProPlus and New Teams Meeting will be the only choice. Same goes with the Outlook Mobile client on iOS/Android which depends on your tenant settings. This is just one part of the story, the big difference is the way that Teams can be more than what SfB was when it comes to collaboration. You need to develop a plan for how to communicate this to your users… You might also have other dependencies with SfB like conference room equipment like Skype Room Systems and integration with PBX. Interoperability between SfB and Teams might not be the best in the world, but we also see Microsoft is pushing Teams and from Ignite sessions, we see that the user experience during interoperability will not change much – what we see is what we get and we better adapt and inform our users so this is clear.